If your family is anything like ours, then pasta salad is always a hit no matter what time of year it is. For some it seems pasta salads are only served during the summer when a cool dish is needed. But pasta salads are a delicious dish no matter what the weather is outside. 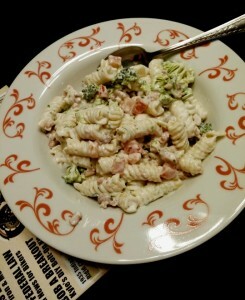 In fact, a pasta salad can be a refreshing treat in the winter when most meals are hearty and hot. Begin this salad by cooking a 16 ounce box of Rotini noodles according to the package directions. While the pasta is cooking, seed and dice two Roma tomatoes and chop up broccoli florets making 2 cups. In a small bowl mix two packages of Hidden Valley Ranch Dressing Mix with 16 ounces of sour cream and 1/4 cup plus 2 tablespoons of milk. Mix well until completely smooth. When the pasta is done, drain, rinse with cold water, drain again and place in a large bowl. Add the chopped tomatoes, chopped broccoli and 5 ounces of cooked bacon pieces. Pour over the prepared dressing mix and combine well. 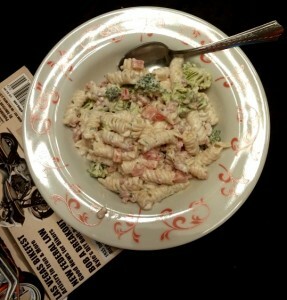 The pasta salad can be served immediately while still warm or refrigerated. 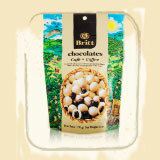 It stores well in the refrigerator for several days when kept in an airtight container. This tasty dish can be a meal all on its own or served as an accompaniment to a main course. Thanks for stopping by today. Do you enjoy pasta salad year-round or only in the summer? What do you like in your pasta salad? While the pasta is cooking, seed and dice two Roma tomatoes and chop up broccoli florets making 2 cups. In a small bowl mix two packages of Hidden Valley Ranch Dressing Mix with 16 ounces of sour cream and ¼ cup plus 2 tablespoons of milk. Mix well until completely smooth.